"Scott Piercy plays a shot on the 16th hole during the Third Round of the BMW Championship at Conway Farms Golf Club on September 19, 2015 in Lake Forest, Illinois." No one ever wishes bad on anyone. Yet as a sports photographer, when a player is having a bad day, it can translate into interesting pictures. Whether that's a easy missed goal, a fumble or even bad drive into the rough. Documenting the BMW Championship at Conway Farms Golf Club was a runaway tournament for Australian golfer Jason Day. However, during the tournament a couple club swingers did their best to get up and down as they chased his low score. 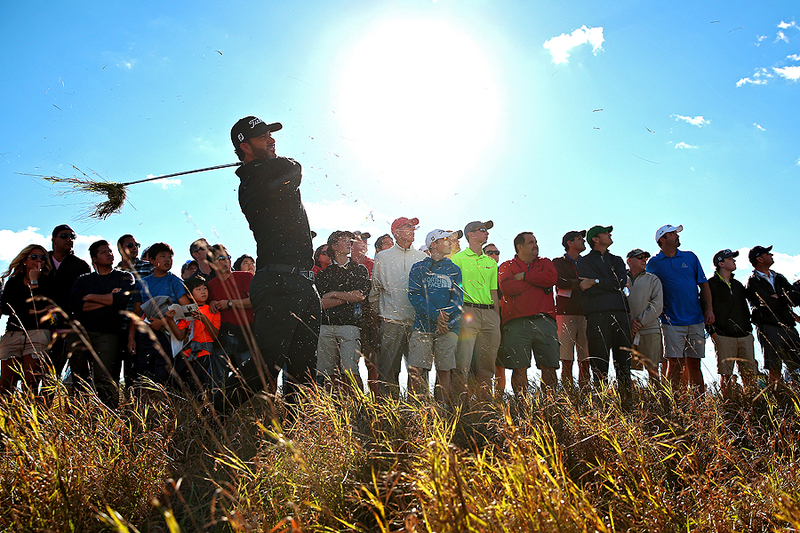 Late in the third round, Scott Piercy was one of those golfers looking to take over the lead. That was until he landed in the deep, thick rough on the 16th hole. After finding his ball, he played a great shot to the fairway. A bad situation turned good for the golfer as well as the photographer. 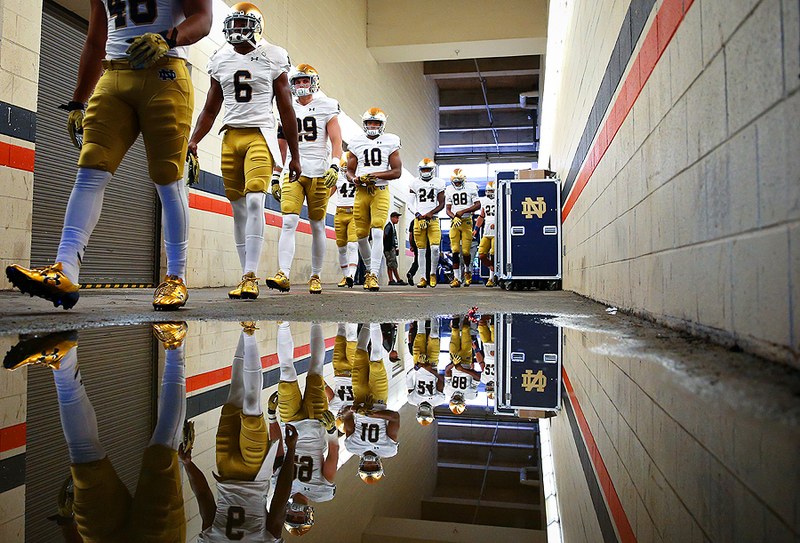 "KeiVarae Russell #6 of the Notre Dame Fighting Irish and teammates walk to the field for warmups before playing the Virginia Cavaliers at Scott Stadium on September 12, 2015 in Charlottesville, Virginia." It had been a long time since I've been to the University of Virginia in Charlottesville - and getting back down south was nostalgic. With college football now in full swing, covering top 20 teams is important. So when the visiting Notre Dame Fighting Irish were playing the Virginia Cavaliers, I found myself making the pilgrimage to Scott Stadium. I had a lot of ideas I wanted to try, yet kept thinking of a visit I made as an intern many, many years before. I was green at the time and didn't really have a clue what I was doing, but captured an action shot that is still in my sports book today. This trip, before the game started, I ventured around looking for something fresh. A gimmick, I found a puddle and waited for the Fighting Irish to exit the locker room. It happened fast, and worked - well enough that I went back for another attempt before the game. Unfortunately, the second shot at bettering the frame was a disappointment, as there were many more players, and the reflection was lost when they stepped onto the water. Glad the frame worked the first time, but always a thought in my mind for next time I return. "Defensive lineman Quinton Jefferson #99 of the Maryland Terrapins and teammates jump into the crowd before playing the Richmond Spiders at Byrd Stadium on September 5, 2015 in College Park, Maryland." College football - there is nothing like it. The game in my opinion is completely different from the pros. Quick, tricky and full of emotion. There is a huge fan base and nothing brings people together like football being played on a wonderful fall Saturday. My first game of the year was up the street between the Richmond Spiders and the Maryland Terrapins. Most teams celebrate after a big win. However, to get pumped up for the game, the Terps leap into the stands before kick-off. It's a picture I've tried to shoot in the past, but the layers never seemed to work until this game. 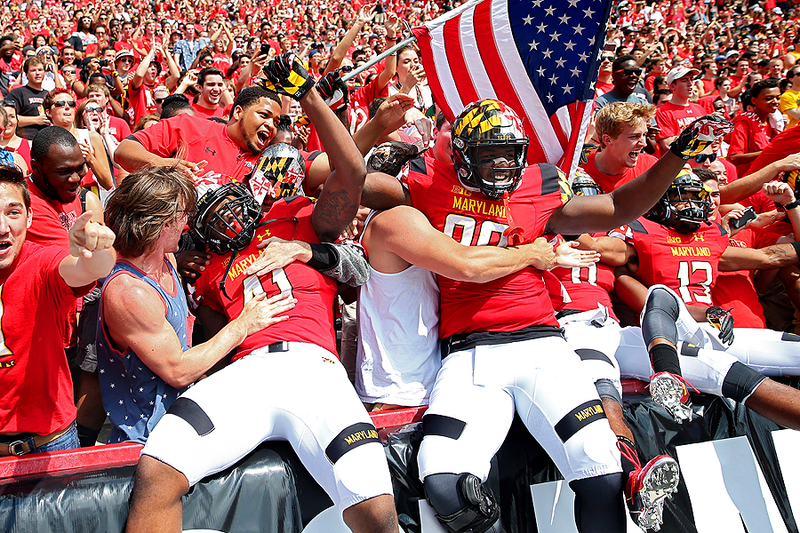 In the end, the Terps came out on top, so their pregame pump up must have worked. "Tight end Je'Ron Hamm #87 of the Washington Redskins is tackled by free safety Josh Evans #26 of the Jacksonville Jaguars in the second quarter at FedExField on September 3, 2015 in Landover, Maryland." It's fall and that means football. Each and every year, the first game of the year is a tough one. 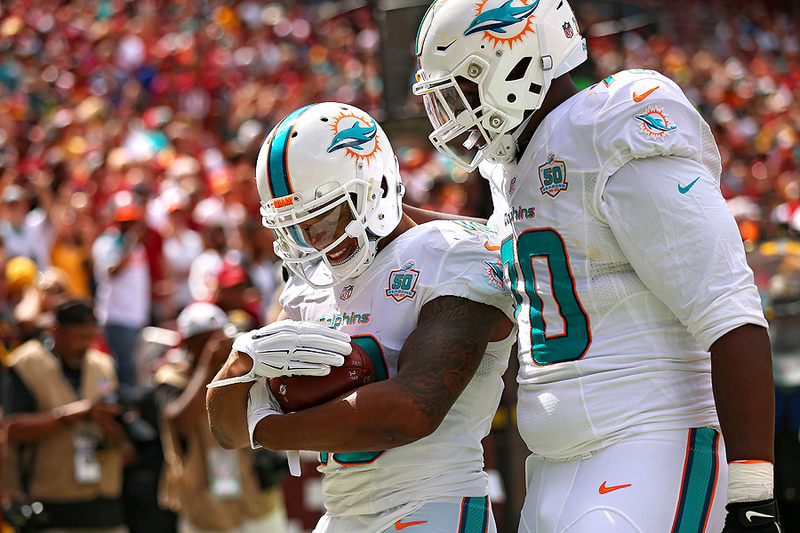 It's time to get excited for big hits and late fourth quarter drives, but that doesn't mean it's a breeze. That first game is never easy. All summer is spent documenting everything except football, so photographers must get back into the rhythm of fast paced sports. 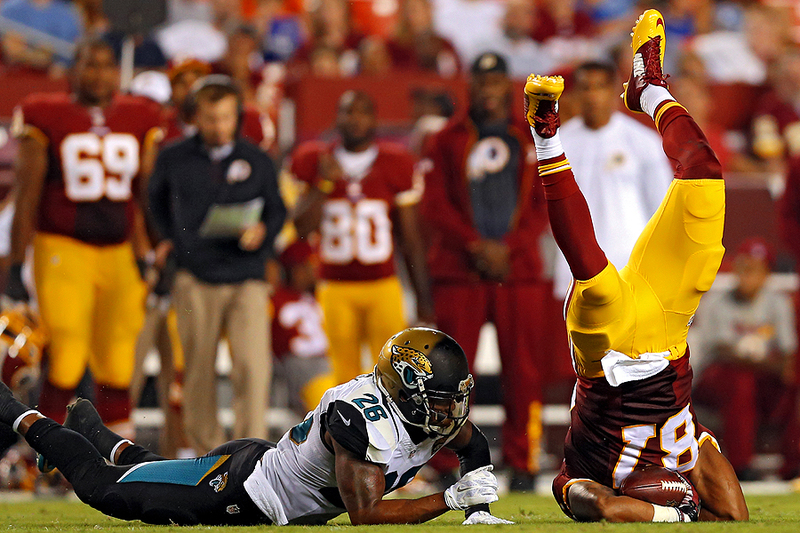 For the Jacksonville Jaguars and the Washington Redskins - it was a close fought battle in the last preseason game. I had a lot of fun despite fighting some jetlag and came away with a couple images I wouldn't expect until mid-season. Looking forward to lots of football and hoping the action continues to be noteworthy. 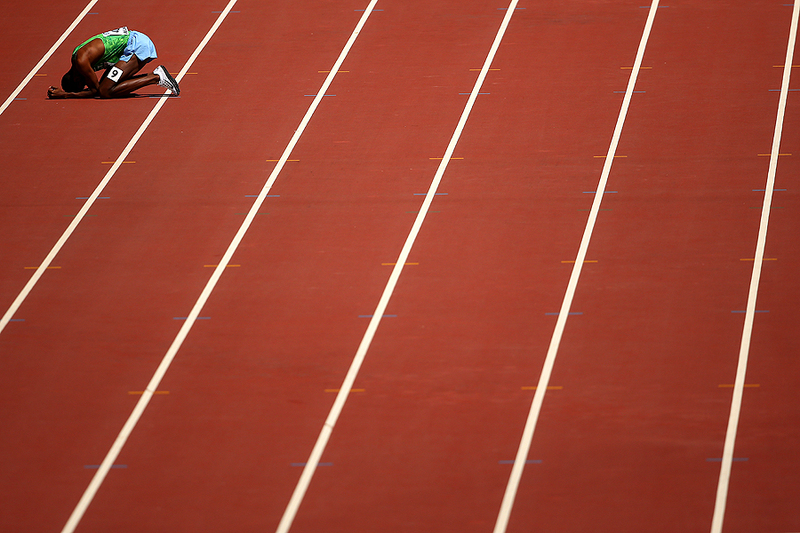 "Ayanleh Souleiman of Djibouti fails to finish the Men's 1500 metres heats during day six of the 15th IAAF World Athletics Championships Beijing 2015 at Beijing National Stadium on August 27, 2015 in Beijing, China." This past month, I had the amazing opportunity to travel to Beijing, China to cover the 15th IAAF World Athletics Championships with Getty Images. Nine days - inside and outside of the oval of Beijing National Stadium - and working as one alongside an amazing Getty Images team of photographers and editors - was a lot of fun and hard work. This event is considered one of the major events in the world as athletes use this extended week to focus on the upcoming Summer Olympics. Every event, every race that takes place here is home to the biggest names in athletics such as Usain Bolt and Ashton Eaton. Being fairly new to the world of athletics, or track and field, everything was fresh. The venue was stunning, the light was fantastic and emotions were tense. With hundreds of photographers and placed in different places each day, these were my views of a fantastic meet in China.